Commands and Colors: Napoleonics—The Best C&C Game Yet? I’ve only played five games of Commands & Colors: Napoleonics. And yet already I know it to be a more interesting game than its cousin, Commands & Colors: Ancients, which I played the heck out of between 2005-2008. The same card-driven mechanic is in play here, as are the left, center, and right divisions of the battlefield. Light, medium, and heavy units are now infantry, cavalry, and artillery units (all of which have some weaker and stronger versions). So on the surface, it’s basically the same game, just with a few tweaks. What’s amazing is that Richard Borg gave players more choices in Napoleonics without making the game much more complicated. Look familiar to some other games you've played? Cavalry Retire and Reform: In the face of an infantry melee attack, cavalry may evade. This works exactly the same as evasion in Ancients, it’s just that only cavalry get this option now. 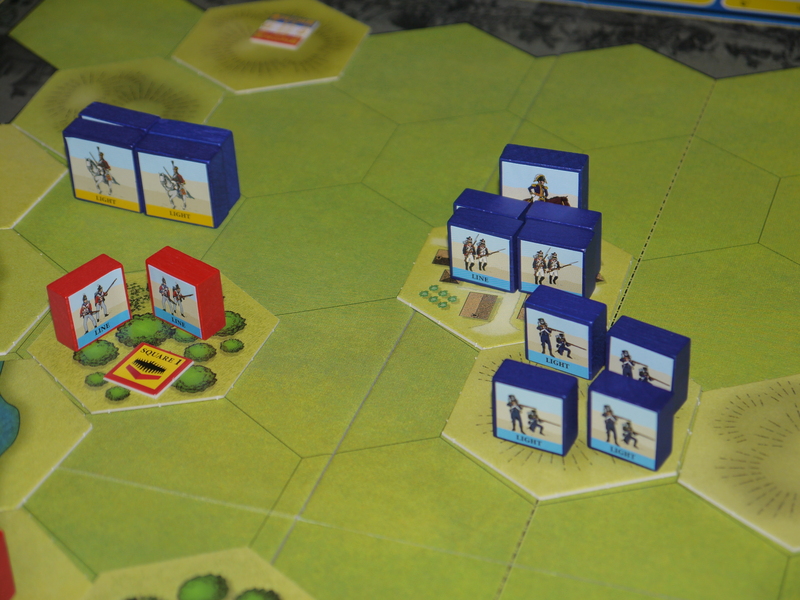 Form Square: In the face of a cavalry melee attack, infantry may assume a square formation. The defending player must have a random card taken from his hand, which is then placed out of play until his unit resumes its usual formation. Attacking cavalry may only attack with one die, regardless of other benefits. 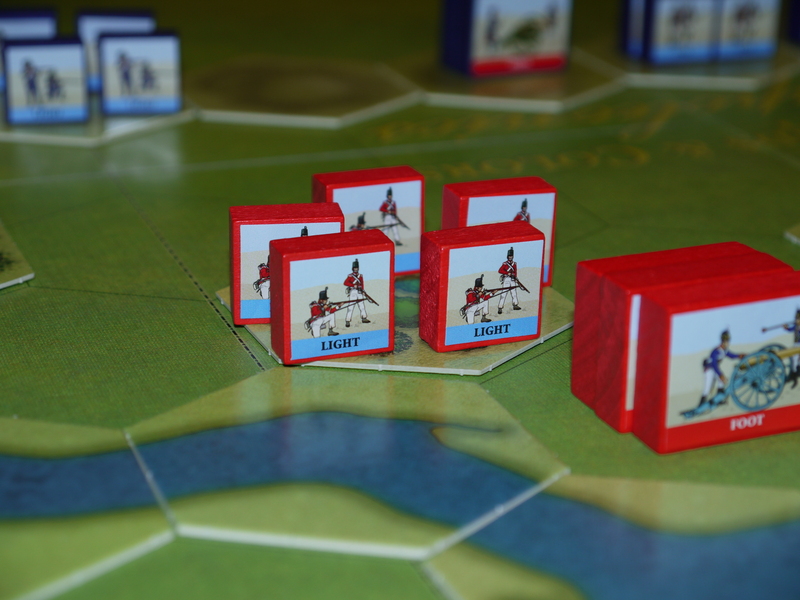 The infantry battles back with one die, but if they score a retreat result on the enemy, the cavalry must move one hex away from the square (a “bounce flag”). This formation is great if your infantry get cut off and are on their own. It’s a very tough choice if they are facing both enemy cavalry and infantry, as their ability to defend themselves against the infantry is vastly reduced. Combined Arms Attack: While attacking, you may order one cavalry/infantry AND one artillery unit to attack at the same time. You roll the normal melee dice for the cavalry or infantry unit, but you also get to add the ranged combat dice of the artillery unit in the same roll. Yup, you might be rolling 8 dice in a massive assault. On my first read through of the rules, I didn’t think these tactics would change the flow of the game much. But about halfway through my first game with General Rick of the allied army, it was clear they were going to matter quite a bit. In the Rolica (first position) scenario, a unit of my French light infantry found itself way out ahead of the rest of my army. Having taken earlier losses, they were at half strength and facing British heavy cavalry and line infantry. Rick ordered both units and chose his cavalry to attack first. I formed square, knowing I would likely survive the attack but also realizing that my troops would get cut to ribbons by the line infantry attack a moment later. However, if I had not formed square, his cavalry likely would have destroyed my unit, received a bonus move, and received a bonus attack against another unit. So while I lost the unit to the second attack, I denied him a breakthrough. The game ended when General Rick executed a perfect combined arms attack. Using cards that allowed his units to move extra hexes, he arranged it so some British artillery was on a hill, firing directly down on my troops (whoops!). Then he brought some line infantry up, ordered both units, and crushed my line in a devastating combined arms attack. He rolled 8 dice in one mighty attack (4 for the line infantry + 4 for the artillery firing at point blank range). Needless to say, this caused one of my full-strength units to magically transform from neat rows of blue-coated musketeers to a pile of corpses and, alas, my French lost the battle. I enjoyed Ancients, but I like Napoleonics even more. I feel like I have more tactical decisions to make, and thus more control over the battle. Once I factor in the varied landscape in each scenario (no more featureless plains like in Ancients) and the specialized units (rifle infantry! horse artillery! cuirassiers! oh my! ), I think I’ll be playing this game for a long time to come. "Uh oh. Form square? Stay in line? Either way, I think we're screwed, guys." Plenty of space left over! 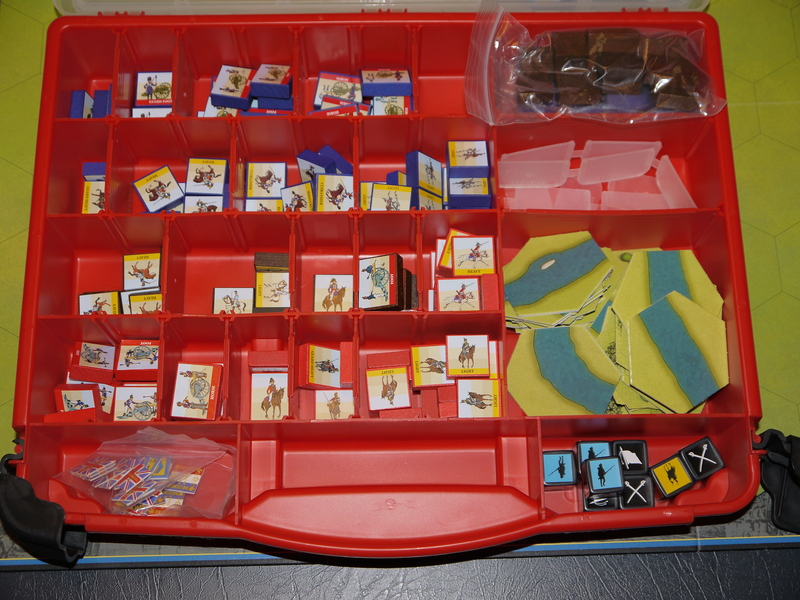 Meanwhile, the bottom portion can easily be arranged to fix the larger pieces–cavalry, artillery, and leaders–as well as dice, terrain, and chits. If I ever purchase an expansion, it will be easy to transfer the last three items to the original game box. This should leave space for expansion playing pieces. 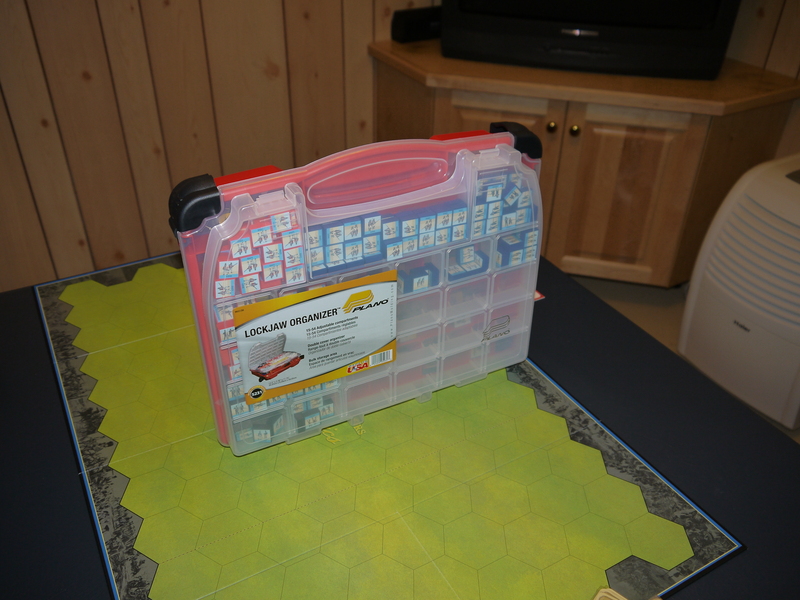 Open the lid, and you've got all large playing pieces with room to spare for terrain, etc. 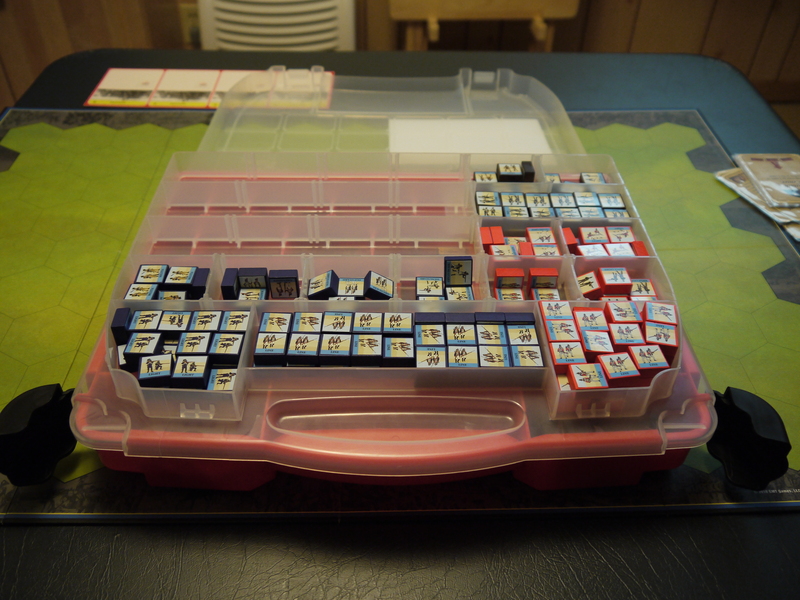 Once you lock everything up, you’ve got a lightweight, organized carrying case for all of your armies. I think it will drastically cut down on setup time for this game. Who knew you could carry the great armies of Europe so easily? BattleTech, Carcassonne, Finca and a Surprise!